It looks like a war memorial. But, this monument, in the town of Svege, in the province of Harjedalen, in Sweden, commemorates another loss. 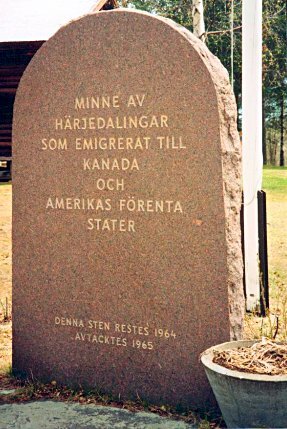 The inscription reads, "In memory of the people of Harjedalen who emigrated to Canada and the United States of America, this stone was raised in 1964 and officially accepted in 1965"
North Americans are descendants of immigrants. The saga of our forebear’s courage to leave all that was familiar to start over in a new world is our common story. We think of immigration in terms of what it meant to us and North America. We don’t often consider how it affected the people and countries they left. We wouldn’t picture the prosperous Scandinavian countries of today as lands where emigration or starvation were the only choices. Yet, in the late 1800’s and early 1900’s emigration from Scandinavia was massive. In one parish in Darmland, Sweden, between 1880 and 1913 two-thirds of the population left. What drove them? Famine. There had been many years of good crops. Children survived and the population grew. When years of drought and famine came there wasn’t enough food to go around and there were too many people for the available farm land. A combination of old farming areas and bad farming years left most of the rural population no choice. By the thousands they departed for North America. As the young men went, girls followed them, because there were no men at home to marry. When Norma Rosen of Kamloops, B.C., was researching the family’s Swedish roots, her host at a bed and breakfast in central Sweden told her that, for four generations back, three-quarters of his family had emigrated. One son from each generation stayed and took over the farm, the rest moved to America. He has more relatives in the U.S. than in Sweden. There were said to be more Icelanders in Manitoba than remained in Iceland. It’s a testament to the hard times in Iceland and the determination of Icelanders to stick together. The town of Gimli, Manitoba is still predominately Icelandic. There is a Chair of Icelandic Studies at the University of Manitoba and a section of the library is devoted to Icelandic works. The largest migrations were in the early 1900’s but emigration continued through the depression of the 1930’s. Most of the emigrants were from rural ,farming localities. These rugged, adaptable people knew how to live in the North and in the bush. Determined and hard-working, they were exactly what Canada, then an emerging agricultural and lumbering country, needed. The newcomers fit perfectly into the economy. They farmed, found employment in logging camps and on railroads. They became carpenters, merchants, and mill-owners. Most did a bit of everything, just as they had in Scandinavia. picture she made of Fredly. Even the landscape was similar. When Ruth Holmin-Schroeder went to Sweden to meet her relatives, she was surprised how much the sandy soil, straight trees and shrubby vegetation resembled that of Valemount, B.C. where her father and many of his compatriots settled. The loss of so many young people must have been tragic for those left behind. In the early days of emigration there was no hope that those leaving would ever see their homes and family again. Goodbye was final. It must have been lonely for the newcomers, from communities established for hundreds of years, in a country where customs and culture were still being formed. Through food and music they tried to preserve something of home. Groups such as the Sons of Norway still wear traditional costumes, do folk dances and try to maintain their language. But, for most, as generations intermarried with other Canadians, the traditional ways were just vaguely remembered stories. Lorna Dramstad-Hutchinson ,who calls herself a Norwegian Maple with roots in both Norway and Canada, keeps Norwegian customs alive in her Canadian household. Her father never cut his ties to Norway. There were regular visits and twice, in 1963 and 1970, the entire family lived for over a year in the Dramstad family home in Mysen, an hour’s drive from Oslo. Lorna went to school in Norway. She joined local kids in speed skating, skiing and compassing. "We would get lost in the woods and try to find our way out!" Asked about a language barrier, she scoffs, "Kids and their games are the same everywhere." In Mysen Lorna and her brothers were the Canadian branch on a multi-generational family tree. She’s convinced that not only songs and dances but traditional attitudes and values are worth preserving in Canada. For example, "Homes in Norway are seldom torn down to rebuild bigger, better houses; they are reconditioned to withstand another one hundred years of life. Fredly, my grand-parent’s house, is a reminder of that. My grand-parents passed away twenty-four years ago. The house remained in the son’s names until another Dramstad could buy it. Today, my cousin lives there where he will keep the Dramstad roots healthy and alive. The farms passed down by my great-grandparents are still in the family." During the plague, Lorna notes, Fredly was moved on logs across a field to a new location. People would not have considered pulling it down. Older people are more respected in Norway. "Grandma and her kitchen were the centre of the family universe." Lorna remembers. All her sons made a point of visiting at Fredly every day to have coffee and a chat with their mother. "I can’t" was not in Grandmother Dramstad’s vocabulary. "Norwegian women do what has to be done, no matter how difficult." Lorna believes that nomadic North Americans don’t have enough rituals and traditions. Norwegian life is rich in ritual. "Norwegians love celebrations" she reminisces. "They celebrate the king’s birthday, Norway’s birthday, the seasons, (June 21st –mid-summer’s day and Dec. 21st, winter solstice), major religious days and family events. With each celebration they need lots of traditional food, their family and friends. In Norway people don’t use the extra day to shop or garden, they participate in the event." Seasonal celebrations are very significant. Mid-summer’s night on June 21st celebrates the light. After months of cold and dark Norwegians revel in long summer days. "Mid-summer’s night celebrations consist of lighting a huge bonfire, eating great food, singing and dancing. "Lorna smiles. At winter solstice on Dec. 21st, sheaves of grain and bundles of dried fruit are put out for both wild and tame animals. Caring for other creatures is important. "You look after the animals," the children were taught, "because they look after you." There was always a pint of ale for the Barne Nisse so he would protect the farm animals. 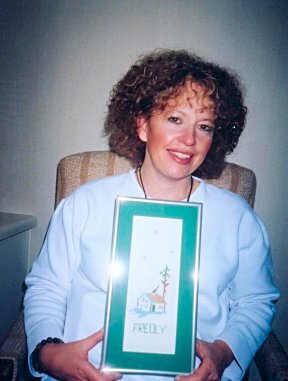 The short Christmas season was devoted to family Lorna remembers. "The entire Dramstad family gathered at my uncles’ house on Christmas Eve. We put the tree in the middle of the room, everyone helped decorate it, then we sang Christmas carols and danced around the tree. After the tree was decorated we had a feast. When the meal was finished, we joined the neighbours for an evening of caroling through the streets of Mysen. At midnight the Yule Nisse came to the house and gave out presents. Christmas morning we went to church to celebrate and the rest of the day we visited. " Lorna’s Canadian Christmas mingles Norwegian cheeses, breads and meatballs, (no pickled herring! ), with turkey and cranberry sauce. Her children know their Norwegian relatives, just as they know the ones in England and Australia. Lorna describes her family as a huge tree with branches stretching from Norway to Canada. "What makes a Norwegian Maple grow, produce, explore and live a long life?" she asks. "Roots!" "If we have no connection with the past," she continues, "we don’t know who we really are. We aren’t full, complete people. We need to know not just the formal history, but our own personal history." Like cherished hand-made linens, the values and traditions that kept Scandinavians strong are being handed on to a new generation.